The prologue of 'About Virginity' begins with its first letter fantastically decorated with beast heads in the style of the late 9th and 10th centuries. Compared with the animal decoration of earlier books, such as the Lindisfarne Gospels, the colours are generally more low-key and the animals more three-dimensional. 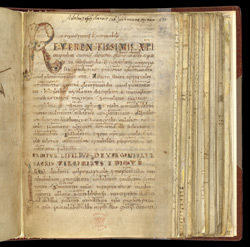 Between the lines of the text are words in Latin and Old English, written in later in the 10th century to aid the reader's understanding of Aldhelm's difficult style. The small size of the book indicates that it was to be read by one or a few individuals at a time.